When Janet Hyde arrived at the Methodist Hospital Emergency Department, her pain level was at a 10. The 76-year-old grandmother had broken her humerus that morning. Now she faced the possibility of surgery and short-term rehabilitation. But that wasn’t her biggest worry while talking to Emergency Department (ED) staff. As the primary caregiver for her husband, who has Alzheimer’s disease, she wondered who would care for him. 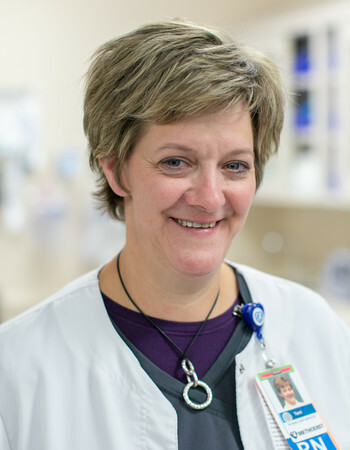 For Janet and her family, geriatric resource nurse Terri Perry, BSN, RN-BC, became a port in the storm. An estimated 10,000 Americans turn 65 each day. Nationally, patients 65 and older account for about 15 percent of emergency room visits. At Methodist Hospital’s Emergency Department, that number is higher: 37 percent so far in 2018, averaging about 29 people a day. Those patients frequently arrive for non-emergent reasons such as falls, pain and weakness. And their unique needs present a challenge: How do you give them the care they need while connecting them with resources so they can prevent hospital admissions and ED visits? In Janet’s case, it meant treating her acute injury while giving the family options for her husband’s care. Deborah Conley, MSN, APRN-CNS, GCNS-BC, FNGNA, and Sue Rohlfs, MSN, MA, RN, share a passion for geriatrics. The Methodist Hospital administrators were intrigued when they heard about a program at Northwestern Medicine in Illinois using dedicated nurses to identify and address non-emergent issues. Not only could such a program address challenges seen in the ED, but it also could fit into Methodist’s systemwide initiative to create solutions for the unique needs of older adults. Conley, director of geriatrics; Rohlfs; and other hospital staff began developing the Geriatric Resource Nurse (GRN) pilot program in early 2016. It began with one GRN seeing patients one day a week. 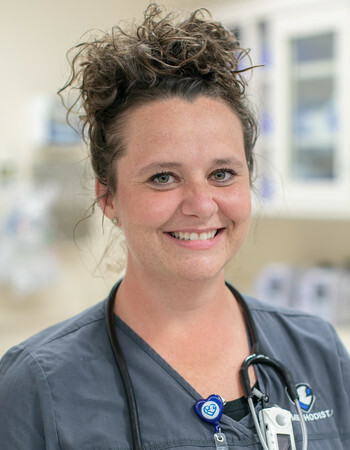 Now Perry; Jessica Lock, BSN, RN-BC; and Nicole Hansen, BSN, RN-BC, rotate to provide coverage every weekday from 7 a.m. to 7 p.m.
“It takes a special person to fill the role." director of doctoral studies at Nebraska Methodist College. Understanding how an ED works and having a love of working with seniors are crucial. “These aren't geriatric nurses working in the ED. These are emergency room nurses with geriatric education, and we did that really very consciously,” said Kindschuh, who helps oversee the program and works to provide nurses the education they need to become GRNs. That education is extensive. GRNs must complete the six-month AgeWISE geropalliative care residency program and spend time getting to know the ins and outs of the other departments and resources they’ll likely be leaning on. Those include the Balance and Fall Physical Therapy program, the Geriatric Evaluation and Management (GEM) Clinic, physical therapy, social work and health coaches. The decision to involve a GRN starts with an ISAR (Identification Senior At Risk) screening, done in under a minute in the course of an emergency nurse’s initial patient assessment. Before this visit, did you need help regularly? In the last 24 hours, have you needed more help than usual? Have you been hospitalized overnight in the last six months? Do you have vision problems that are uncorrected with glasses? Do you have serious memory problems? Do you take more than five medications daily? The wording or course of the conversation may vary, but the goal is to get a feel for a patient’s health and risks beyond the current visit. If a patient coming from home answers yes to two or more questions, a GRN is alerted. In the Methodist Hospital emergency department this year, 55-60 percent of patients over 65 have been identified as people who could benefit from time with a GRN. On any given day, a GRN might personally visit with as many as six seniors with the greatest needs. 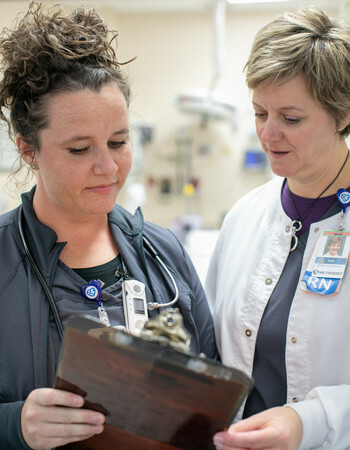 While a staff emergency nurse focuses on treating patients’ symptoms, GRNs have the more time-consuming tasks of identifying the causes and connecting patients and families with the resources they need. Before the GRN program, many of those duties were part of an emergency nurse’s already-full plate. Despite their best efforts, they couldn’t address everything. During Janet’s stay, the focus was on her husband’s safety. Perry gave Janet and her family “invaluable” information on home-health options in the event her recovery limited her ability to care for him. A GRN’s job doesn’t end when the patient leaves the ED. Within a few days, she calls the patient, asking how a follow-up appointment went, if a prescription was picked up or if there are any issues or questions. Those calls continue that personal connection that began in the emergency department, and they sometimes help diagnose and solve problems. “I can’t tell you the number of ED readmissions I have prevented over the phone, just by answering simple questions,” Lock said. There’s wide consensus that the GRN program at Methodist has been a success. Data on two of its initial goals – decreasing hospital admissions and preventable ED visits – are hard to pin down. But there’s plenty of evidence pointing to increased satisfaction among patients, nurses and providers. Patients and families are “just floored” by the extra attention, according to Lock. A fourth GRN is joining the rotation this winter, and other nurses are getting geriatric care training. Across the Methodist system – whether working side-by-side with emergency doctors and nurses or problem-solving with health coaches at primary providers’ office – GRNs have become a valuable resource. What does the future hold? There are no firm plans for expansion at the moment, but “as the volumes grow, we’ll be right there waiting to grow,” Rohlfs said. 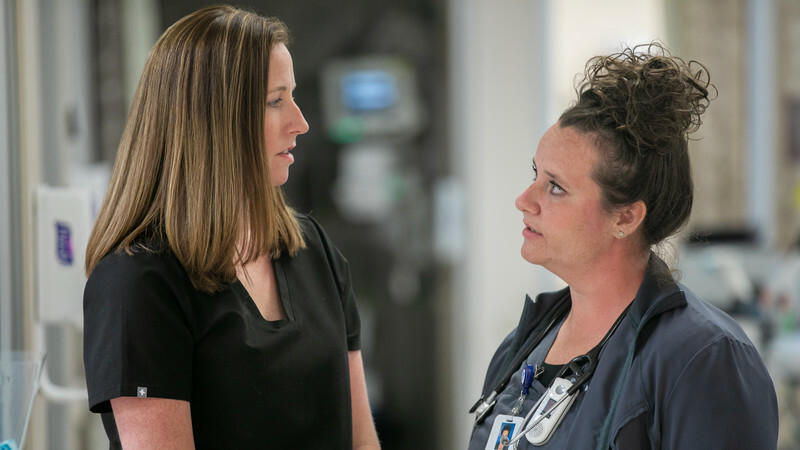 Laura Millemon, MD, left, a physician in the Methodist Hospital Emergency Department, consults with geriatric resource nurse Jessica Lock, BSN, RN-BC. Training and planning have been crucial to the GRN program’s success, but the most important component is the people who make it work. People like Perry and Lock, who combine top-notch nursing with a love for older adults. For patients and families, it’s another way they are touched by Methodist’s commitment to care.